Bengaluru and Delhi airports had the fastest growth in passenger traffic in 2016 among global peers. Airports in Bengaluru and Delhi showed the fastest growth in passenger traffic in 2016 among global peers, aided by a surge in domestic air travel and introduction of new routes. With a 22.5 per cent growth, Bengaluru airport was ranked first among airports handling 15-million-plus passengers annually. Delhi, which recorded 21 per cent year-on-year (y-o-y) growth, bagged the first position ahead of Incheon (South Korea) and Kunming (China), among airports handling 40-million-plus passengers a year. The slot constrained Mumbai airport, which registered a growth of 9.9 per cent and took the fifth position. Bengaluru and Delhi handed 22.2 million and 55.6 million passengers, respectively, in 2016. The ranking was released earlier this week in a report by the Airports Council International, a trade association of world airports. Delhi continues to show highest growth in the current year, and has recorded 14.9 per cent growth in the first eight months. Domestic air traffic rose 23 per cent y-o-y to 99.8 million, making India the fastest-growing air travel market in 2016. In the first eight months of 2017, traffic rose nearly 17 per cent, according to the Directorate General of Civil Aviation. "Slots are not available at Mumbai airport, and airlines have added new flights from Delhi and Bengaluru," said Ameya Joshi, founder of aviation blog Network Thoughts. "On domestic routes," Joshi added, "IndiGo and Vistara have led capacity expansion while Air India introduced new international flights from Delhi to San Francisco and Madrid in end-2015 and -2016, respectively." Delhi also saw the introduction of Korean Air's service to Seoul, while new routes to Rajahmundry, Amritsar, Imphal, Jorhat and Port Blair were added at Bengaluru airport. Jet Airways added new services from Bengaluru to Colombo and Singapore. In fact, traffic growth at Bengaluru airport was faster than estimated, and the airport crossed 22 million passengers in 2016, a year ahead of the estimate. Last December, Bengaluru airport handled 2.15 million passengers, the highest-ever traffic recorded in a month by an airport in southern India. However, the rapid growth in air travel is putting a strain on airport infrastructure across the country. Even Delhi and Bengaluru airports are staring at a shortage of slots. 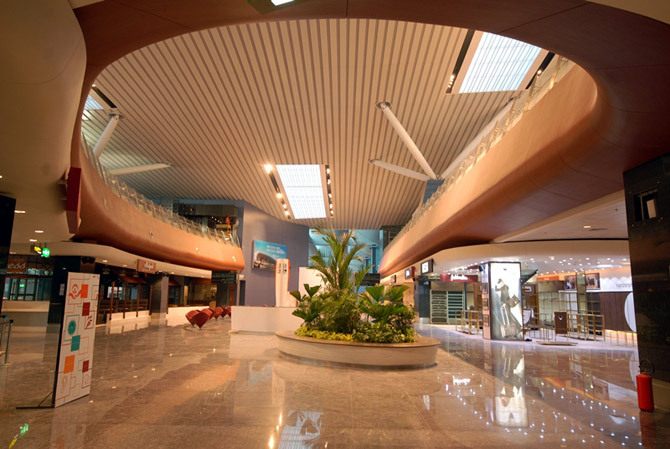 The GMR Group plans to invest Rs 16,000 crore (Rs 160 billion) for expansion of Delhi airport that will double the capacity of domestic terminal T1, increase the capacity of international terminal T3, lay a new runway, and build a new terminal over the next seven years. The situation is no better at the Airports Authority of India (AAI)-run airports; 25 of 126 airports managed by AAI have reached saturation. Over the next two to three years, seven more airports -- including Varanasi, Raipur and Indore -- will reach peak capacity. Both Chennai and Kolkata will require a second airport, and the AAI has asked state governments to identify land for the same. 35 airports in India don't have night landing facility!